Peter Webber (Hannibal Rising) will direct The Spider’s House, a romantic drama following two ex-lovers who meet again in 1950s Morocco, on a backdrop of growing tensions between freedom fighters and French colonials. It is adapted by newcomer Laurie Cooke from a novel by Paul Bowles (The Sheltering Sky). The 1987 classic supernatural thriller Angel Heart is getting the remake treatment. The original film was written and directed by Alan Parker (The Life Of David Gale), based on a book by William Hjortsberg (Legend), and stars Mickey Rourke (Stormbreaker), Robert De Niro (Righteous Kill) and Charlotte Rampling (The Duchess) among others. Watch the original’s trailer below. Jack Black (Tropic Thunder) will star in an untitled spoof of the Bourne films, from the screenwriters of Kung Fu Panda, Jonathan Aibel and Glenn Berger. Black will play an amnesiac who’s convinced he must be a spy…FYI, this movie was already made last year into the very unfunny Code Name: The Cleaner. Philip Seymour Hoffman (Charlie Wilson’s War) will voice Max in Mary And Max, a claymation film about two penpals, an 8 year old Australian girl and a 44 year old Jewish New Yorker dude. In the meantime you’ll be able to catch him in the incredible looking films Synecdoche, New York (see the trailer) and Doubt (see the trailer). 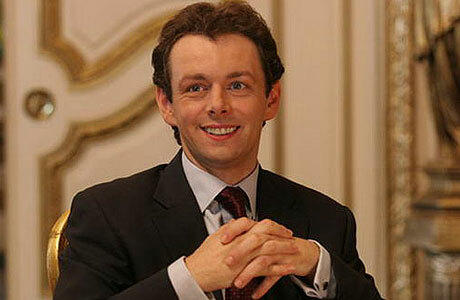 British actor Michael Sheen (Blood Diamond) just signed onto two films: the new Alice In Wonderland movie from director Tim Burton (Sweeney Todd: The Demon Barber Of Fleet Street) and the terrorism-themed thriller Unthinkable from Australian director Gregor Jordan (Ned Kelly), also starring Samuel L. Jackson (Lakeview Terrace) and Carrie-Anne Moss (Disturbia). Director Martin Scorsese (The Departed) is set to reunite with regular star Robert De Niro more than 13 years after the mob flick Casino. The new film will be based on the non-fiction book I Heard You Paint Houses from author Charles Brandt, as adapted by multi-award winning screenwriter Steven Zaillian (American Gangster). This entry was posted in American Films, Animated Movies, Celebrities, Espionnage Movies, Movie Trailers, Movies Based On A True Story, Remakes, Spoof Movies, Supernatural Thrillers, Videos and tagged Alan Parker, Alice In Wonderland, American Gangster, Angel Heart, Blood Diamond, Carrie-Anne Moss, Casino, Charles Brandt, Charlie Wilson's War, Charlotte Rampling, Code Name: The Cleaner, Disturbia, Doubt, Glenn Berger, Gregor Jordan, Hannibal Rising, I Heard You Paint Houses, Jack Black, Jason Bourne, Jonathan Aibel, Kung Fu Panda, Lakeview Terrace, Laurie Cooke, Legend, Martin Scorsese, Mary And Max, Michael Sheen, Mickey Rourke, Morocco, Ned Kelly, New York, Paul Bowles, Peter Webber, Philip Seymour Hoffman, Righteous Kill, Robert De Niro, Samuel L. Jackson, Steven Zaillian, Stormbreaker, Sweeney Todd: The Demon Barber Of Fleet Street, Synecdoche, The Departed, The Duchess, The Life Of David Gale, The Sheltering Sky, The Spider's House, Tim Burton, Tropic Thunder, Unthinkable, William Hjortsberg by Mr Hollywood. Bookmark the permalink.